The 2016 Heritage Address was held on Thursday 21 April at Melbourne Museum featuring Museums Victoria CEO Dr J Patrick Greene OBE speaking on “A Heritage Journey in Three Chapters”. Patrick examined the role of Heritage through the lens of three major projects in which he played a lead role – Norton Priory in Cheshire, UK; the Museum of Science and Industry in Manchester, UK, and Museum Victoria. He described some of the factors that have influenced his approach to Heritage projects and lessons learnt on his journey of three chapters. Sale historian Peter Synan (right) was named as the 2016 recipient of the Heritage Council of Victoria Heritage Volunteer Award. 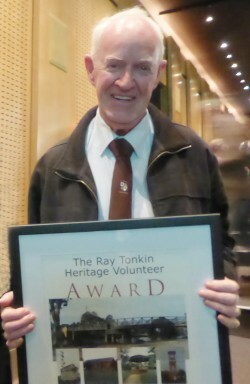 The Ray Tonkin Award, presented since 2010 at the Heritage Council of Victoria’s annual Heritage Address at Melbourne Museum, recognises the significant role volunteers play in the maintenance and preservation of Victoria’s heritage. A long serving member of Sale Historical Society, Peter has led many projects to restore and celebrate local heritage and milestones and is the author of numerous local history books. Heritage Council Chair Professor Stuart Macintyre AO said Peter’s work had ensured the district’s history was accessible and that significant milestones and places were recognized.